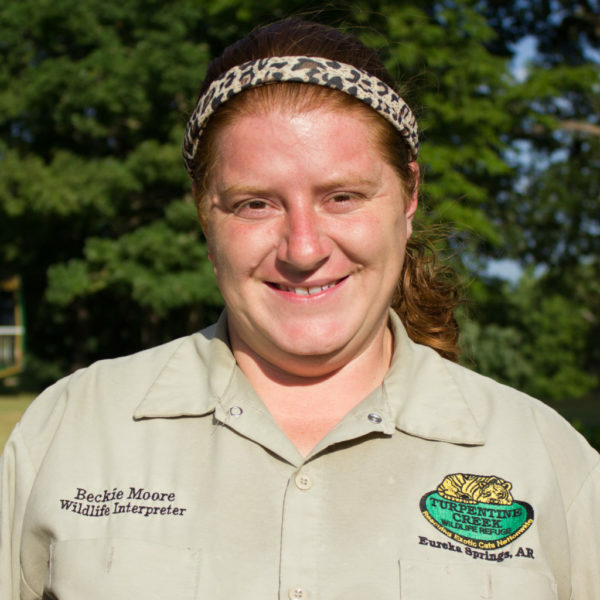 Beckie has always had a passion for wildlife –from the smallest insect to the majestic bald eagle. Having grown up coming to the Refuge and visiting all of the animals, when the opportunity to work at Turpentine Creek Wildlife Refuge came up, she jumped at the chance to become a part of such an amazing facility. She is the Education Coordinator/Wildlife Interpreter for the refuge and loves helping visitors explore the refuge, discovering more about what TCWR does to help these magnificent creatures. It is through education that TCWR can help to protect the future of big cats not only from the exotic pet trade but also in protecting their habitats to ensure their survival. She attended the University of Arkansas and received her BS in Education with a focus on Wildlife Interpretation. Working for the Arkansas State Parks as a Park Interpreter, she was able to help connect people to the flora and fauna of our wonderful state. After almost 5 years of working for the parks, she decided to return home and go to graduate school for Biology at the University of Arkansas.